Harman’s Cheese & Country Store in Sugar Hill, NH, ships its “World’s Greatest Cheddar Cheese” to customers around the country and, sometimes, across the globe. A whopping twelve tons of Harman’s really aged cheddar leaves the store each year, either through customers who visit the small, red clapboard house tucked along Main Street or through mail order sales. Last week, friends and neighbors gathered at the store to help with the annual unloading of the cheese – all 25,661 pounds of it – which arrived via tractor trailer truck from upstate New York, where it is made and aged two years specifically for Harman’s. Harman’s is a family business, purchased from the original owners (John and Kate Harman) in 1981 by Maxine and Bert Aldrich. Bert died two years ago, and Maxine continues to run the store with her daughter Brenda Aldrich. The small shop offers plenty of local flavor – Zelda’s Jams and Jellies from Lancaster to the north, Two Sisters’ garlic jellies from Canterbury to the south, maple syrup produced right down the road, and other gourmet food items from throughout New England. In the quiet town of Sugar Hill, without its own bank or grocer or village store, Harman’s is a place where locals often stop in for the latest scuttlebutt and to stock up on cheese and some of the other eclectic regional items stocked in the small store. Because the store is along one of the prettiest drives around, visitors also come in for directions or a gander at the items inside. The Aldriches do a lot for the community, much of it behind the scenes, including organizing and promoting the annual Lupine Festival in the spring and the Celebration of Autumn each fall, which attract visitors from near and far. 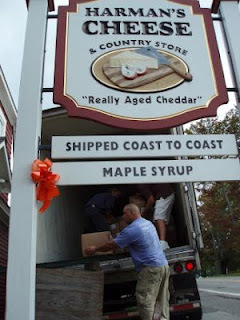 Their friends and neighbors reciprocate during the annual unloading of the cheddar. Last week’s unloading crew included Brenda and Maxine, a couple of strong-backed neighbors, and a few friends. Some of them have helped unload the World’s Greatest Cheddar for years. Others are new to the scene. Together they moved 600 blocks of cheese – each weighs upwards of 45 pounds – from the truck, down antique rollers, and into the walk-in cooler which by day’s end was filled to capacity. Overflow was carted to Windy Ridge Orchard in No. Haverhill, one of a handful of area businesses that will lend cooler space to Harman’s on occasion. The folks who gathered to unload the cheese were all volunteers, and willing ones. Their payment for a couple hours of hard work? The satisfaction of helping a good neighbor with a tough job – and a block of the World’s Greatest Cheddar Cheese, of course. I volunteered a year ago, when my kids were still in preschool. Really, I wanted to make sure no one else got the job. Maybe I should have guessed from the recreation director’s reaction that coaching kindergarten soccer isn’t the most sought-after position around. So, get the job I did, and last week I made it through my first kindergarten soccer practice as coach. Actually, it was a blast. I’m not sure who had more fun – me or the kids. Between the running and kicking and giggling I threw in a few tidbits about proper passing technique and important rules like no hands on the ball. As I see it, the point of most things when you’re 5 years old is to have fun. If soccer practice is fun, they’ll keep coming, keep learning. 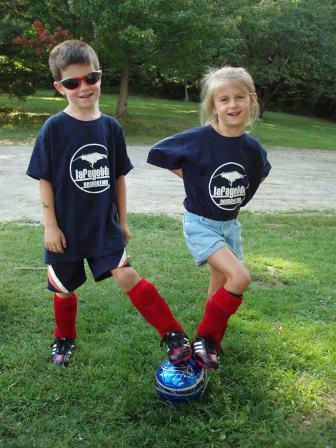 And someday, I hope, these kids will develop a love of the game like the one I have fostered since I was a little kid. Of all the sports I have played and watched, it is soccer (and skiing, but don’t ask me to choose one) that has held my attention and my passion for most of my life. I grew up living and breathing soccer in a field hockey and (American) football town. No matter, soccer was my game from the first kick. One summer during high school I attended three different soccer camps. For a while, after reading that Maradona or Pele or some other huge star had slept with a soccer ball as a child, I slept with a soccer ball, curling around its perfect orb every night. When other girls hung pictures of boy bands on their walls, I put up posters of soccer players. I spent hours in the backyard working on my juggling skills, honing offensive moves, and building up my left-footed kick until it was stronger than my right. I played through high school, then in college, going from a star on a mediocre high school squad to bench warmer and understudy on a defending NCAA championship team. I volunteered as a media intern during the 1994 World Cup and nearly died of pure, awed happiness when I was on the sidelines for the warm-up of the quarterfinal between Italy and Spain. Four years earlier, I had watched (on television) the men’s U.S. squad qualify for the 1990 World Cup, the first time they’d made the show since 1950. That summer I watched every game I could on Univision, the Spanish language channel whose football commentator was famous for his enthusiastic and long-winded scream of “Goal!!! Goooooaaaaaalllllllllllllllllllll!!! !” I don’t understand Spanish, and some of the World Cup games were also on American networks. But those channels ran commercials during the matches, regardless of what was happening in the game during scheduled advertising breaks. And the commentators were rotten. During my post-college years in Colorado, I played with a super fun co-ed team in summer tournaments and winter kick-arounds in an old school gym. We were pretty good on the field, and we won a few tourneys. We nearly always won the Saturday night party, too. When I moved to the west of Ireland for a summer, I was thrilled to find a women’s team comprising a variety of ages and skill levels. Regardless of our footballing ability and the result of that evening’s match, we always sang on the van ride home, our good cheer inserting joy into somber Irish ballads. Alas, in recent years I haven’t played much soccer, but I did get out to a few pick-up games this summer. And while I don’t know all the big name players like I used to, I’m always happy to stumble across a game on television, and I watch the World Cup and Olympic matches as often as I can. My kids watch with me sometimes, asking endless questions: Which team do you want to win? Who’s in the blue shirts? Where is the goalie? Why did she do that? We’ve set up a little field in the front yard and the kids love to go out and play there. They think shin guards and soccer socks are really cool. I hope these are all signs of the beginning of their love of the game. After our first practice last week, which was also an introduction to team sports for many of the kids, a few parents posted photos of their kindergarten footballers on Facebook. They all looked happy, with their shin guards jutting out from skinny legs, their multi-colored cleats, their proud smiles. I hope that joy stays with them through this first soccer season and many more. After that practice, there was a meeting for all the coaches up through 6th grade soccer. When I was introduced as the kindergarten coach, the others chuckled knowingly. They’ve moved on to refined techniques and tactics with the older kids. But they know. Most of them coached the little ones first. And they’re still coaching, moving up with their own kids, teaching them the world’s most popular game. I imagine they all do it for the same reasons that I do. For the kids. And for the love the game. A version of this essay ran in the Sept. 14, 2012 edition of the Record-Littleton. The light of a waning blue moon filled the clear night sky Saturday. The air was crisp, bordering on chilly. Dusk came earlier than in mid-summer. It was a perfect night to introduce the kids to camping, and the first time I have slept outdoors in far too long. We borrowed a nearly-new tent from friends, and I dug out my much smaller, 15-year-old backpacking tent from the days when I used to sleep outside on a somewhat regular basis. That little tent has sheltered me alone and with good friends, in deserts and forests, on bike trips and road trips and solo summer hikes where I laid awake listening to the eerily-close howl of coyotes. I’ve slept there during an April snowstorm near the Grand Canyon, at Mesa Verde and the Canyonlands, and near the Canyon DeChelly, part of the Navajo Nation. Saturday, that tent became the “Mama and Papa Tent” in our backyard campground, as the kids claimed the newer, roomier dome as theirs. The children’s excitement was palpable, although whether for the campout or the accompanying s’mores I’m not sure. Three small sleeping bags were tucked into the tent before lunchtime, with the added necessities of stuffed animals and blankies. After a busy afternoon away from home, the kids plowed through dinner, donned jammies, and bounced around until it was dark enough to light the fire and the tiki torches and get to business. 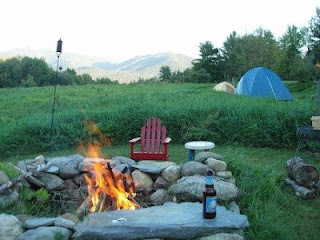 We roasted marshmallows as an amber moon peeked over the mountains, then rose and brightened to white high above them. We thought for sure the kids would want to retreat inside at some point that night. But after one last “I love you” across the small expanse between tents, they quieted, and they stayed quiet until morning. As the morning sun worked through gathering clouds, the littlest kid launched into an impromptu song with no words, her tune joining the smattering of early birdsong and the distant cawing of crows. Soon her brother and sister were up, too, and as the happy chatter veered toward bickering, I headed to the kids’ tent to check on their night. They all proudly declared that they hadn’t been scared at all to sleep in the wilds of the back yard, bears or no. As the first of that day’s many raindrops hit the tent fly, we headed in, refreshed from a night under the stars – and happy to have a dry place to cook and eat breakfast. The kids were ready for backyard camping round two that night. Alas, the weekend had other plans for us. Sleeping bags were stuffed back into their sacks, stuffed animals placed back into their inside beds, and the tents dried out and put away. We vowed to go camping – in the backyard or further afield – more regularly. Maybe once or twice a year. Definitely more often than once in a blue moon.